Can't attend? Follow Singapore Red Cross to know of future events! "Fish For Food" may just be another fishing competition to you. Every ticket you buy, you can feed a family of 4 for 5 days! As Singapore becomes more affluent, it is hard to believe that amongst us there are people living in poverty. The poverty situation in Singapore is real, and it is not something that we can ignore. Singapore Red Cross (SRC) has identified 70 families who can benefit from a sustainable service that puts food on their table. SRC's FoodAid service provides monthly rations of nutritious meals to our beneficiaries. Mdm Tang, who has a daughter residing at the Red Cross Home for the Disabled and a grandchild to care for, is one of our FoodAid beneficiaries. "I don't work, I don't have an income. On top of my monthly utilities, I also have to pay for the rental of this flat and food for the children. We adults can skip a meal, but our children have to eat," she shared. Everyone deserves a healthy meal, but not everyone can afford it, unless there is someone who cares for them. You can do your part to touch more lives through SRC's FoodAid service. In December 2015, SRC will have a series of "Fish For Food" activities to support our SRC's FoodAid beneficiaries in our local community. Restaurants are dedicating portions of their sales proceeds from one of their signature dishes. Anglers at D'Best fishing pond will be encouraged to donate some, if not all of their catches to our beneficiaries to complement their food ration with nutritious fresh fish. Sponsors are chipping in to ensure that the SRC's FoodAid service continues to touch the lives of our skipped generation, single-parent and working poor beneficiaries and their families. 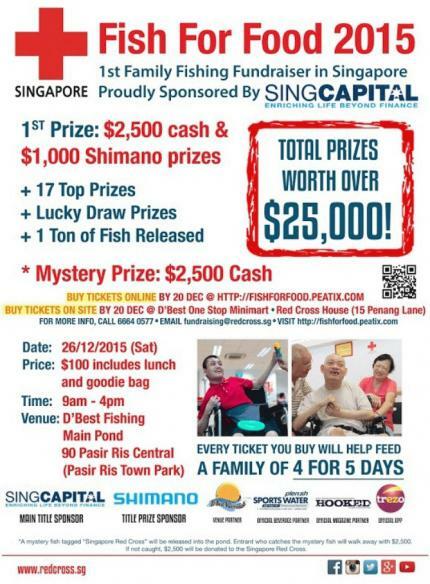 The grand finale to the month-long activities, the "Fish For Food" fishing fundraising competition, will be held at D'Best fishing pond on 26 December 2015 (Saturday) from 9am - 4pm. The competition strives to raise $150,000 for SRC's FoodAid service. Total Prizes worth more than $25,000! *The list of prizes will be updated weekly. Stay tuned for more exciting prizes. 1 fish tagged with the Singapore Red Cross logo will be released in the pond. The angler who catches the mystery fish will walk away with $2,500 CASH. If not caught, $2,500 will be donated to Singapore Red Cross. ** PLUS more than 25 Lucky Draw Prizes to be won throughout the day! Buy your tickets now, and make a difference in someone's life today. If you do not FISH, you can help the FoodAid beneficiaries as well! How you can do so? More restaurants will be updated weekly. Other ways that you can do more to help our local humanitarian services. Please bring your own Fishing Rod and Reels for this event.